Firstly we dont want you to worry about anything - the RV comes with bed linen and comforters for all 8 people, as well as plates, bowls, flatware, glasses and even the basics - coffee, olive oil, salt and pepper. We are even happy for you to have food delivered ahead, and we will place in the ready cooled down fridge for your vacation. 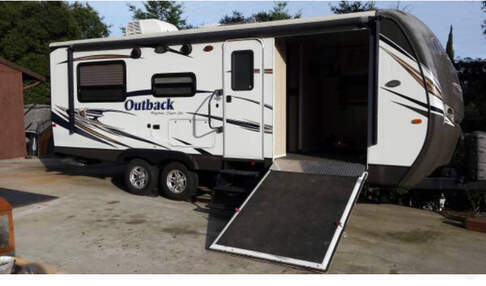 We love this RV - its where we spend the best time with my grand daughter and family - we want you to be able to get on with your vacation without having to worry about anything. That why we offer pickup at all the local airports. We also dont nickel and dime - you only pay for cleaning, if it needs extra cleaning, you only pay for laundry for the linens you use. We treat you, the way we would want to be treated. There are 5 TV's in the coach, (my son in law thinks its to much) - but the kids can watch their own individual TV's in the bunks, while Mom and Dad have thiers in the master, but you can still watch as a family in the kitchen, or the outside TV - great for football and grilling. 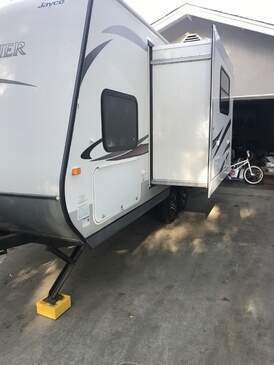 You can also use the RV if you need extra beds for you home, in which case we will discount your unused mileage in the bay area - and your guests get real beds and privacy on your property - great for easter and thanksgiving. We do ask for a minimum 48 hours lead time on reservations. This vehicle is from a private owner. This van is unbelievable and a great fit for two people. Everywhere this van goes... people turn their head! It's beautiful! The kitchen - with its refrigerator, microwave, oven and range - is fully stocked. The queen sized bed is super comfy and easily folds up into a seating area when you aren't sleeping. With a bathroom and shower inside the cab, you'll have immediate access to everything you need for a comfortable and relaxing experience. If you are interested in renting Sparkles, I'd like to have a quick phone call converation with you before you submit any payment confirmation. I find it is best to touch base quickly to make sure Sparkles is a good fit for your needs. A great choice for groups of 2 to 4 travelers. This vehicle is from a private owner. This diesel motor home with 4 slides is a home on wheels. Complete with a washer/dryer, solar panels and outdoor BBQ. Our motor home recently had a makeover. With hardwood floors, new captains chairs, hide 2 hide-a-bed couches, window shades and navigational system, traveling in this coach is very comfortable. The Keystone Outback is a perfect solution to a great vacation! It has a lot of character and can fit your whole family. Very easy to set up and tow! Only 3500lbs. 20ft sleeps 5-6. 8ft slide out. Full kitchen, shower, sink, toilet, oven, microwave & super cold fridge with freezer.Plenty of storage. Electric Husky jack. Dual axel. 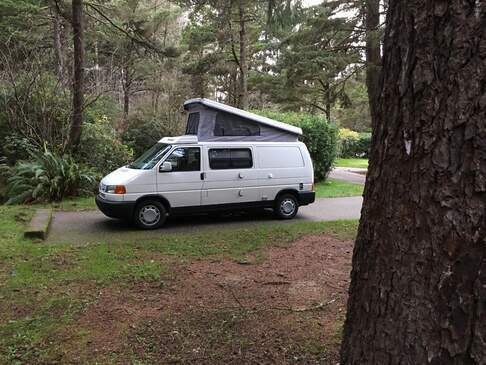 Morrison is a 1999 VW Eurovan Camper complete with a stove, refrigerator, sink, a closet with plenty of storage. It has a new bluetooth stereo system that enables multiple inputs and internet streaming. The kitchen is complete with everything to enjoy your morning coffee and to make a delicious breakfast lunch or dinner. The upstairs (poptop) sleeps 3-4 people and has a new tent with screens and closeable flaps for summer or winter sleeping. The downstairs sleeping can accommodate 2-4 people as well. The entire cabin has central heat for winter camping. The cabin stays cozy all night. We also provide comforters and sheets for both beds along with pillows. This is an excellent option for budget travel. This vehicle is from a private owner. A very good option for couples or families. This vehicle is from a private owner. Renters consistently rate this vehicle as excellent. Good choice if you want to relax at the same spot a few days. This vehicle is from a private owner. Whether you’re visiting San Jose for the sunny weather, the ample attractions, or the beautiful scenery, there’s one sure-fire way to ensure that your trip is as good as it possibly can be: renting an RV! When you rent an RV in San Jose, you set yourself up to see everything this beautiful area has to offer without breaking the bank and without stressing yourself out over expensive hotel rooms. Whatever you choose to do in San Jose with your rental RV, be sure not to miss these exciting San Jose attractions! Outdoor Attractions. One of San Jose’s main draws is its beautiful weather and visitors love to take advantage of it through attractions like Paramount’s Great America, which is a family-friendly amusement park that offers games, shows, and rides. Perfect for a family on the way to a family reunion or a bunch of friends getting ready to head down the coast, this is one thing you won’t want to miss. If an amusement park isn’t on your list of things to do, head to the San Jose Heritage Rose Garden, which boasts more than 5,000 different varieties of roses. An RV rental makes it all easy to see! Museums and Cultural Attractions. San Jose has more than its fair share of museums and cultural attractions, including the Rosicrucian Egyptian Museum and Planetarium and the Tech Museum of Innovation. Don’t miss the San Jose Museum of Art or the family-friendly Discovery Museum of San Jose. Sports. To cool off and catch a game, head to the HP Pavilion, which houses the city’s NHL team and hosts everything from football to basketball in the off-season. Class A RVs. Class A RVs are our most luxurious options. Designed to accommodate large groups on long trips, these RVs come complete with all possible amenities and can comfortably sleep a large number of people. Ideal for those who don’t want to sacrifice comfort during their road trips, these RVs are perfect for riding in the lap of luxury the entire way. Class B & C RVs. 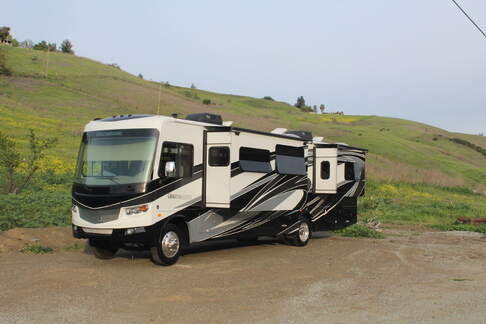 Class B & C RVs are a perfect blend of comfort, style, affordability, and class. These RVs offer convenient amenities without costing a fortune and are perfect for smaller groups that want to make their upcoming road trip to San Jose one for the memory books. If you’re planning on spending a number of weeks or months on the road in and around San Jose, you may want to consider opting for a travel trailer. Maneuverable, efficient, and comfortable, these trailers are perfect for people who want to camp and enjoy the flexibility that a trailer has to offer. Complete with many of the same amenities as our larger RVs but boasting a smaller footprint and more placement options, our travel trailers are a popular rental option. Vans. If you’re looking for something that provides comfort and style without the large footprint of our larger RVs, consider opting for a van. These compact and comfortable options are ideal for seeing everything the San Jose area has to offer and making memories that will last a lifetime. At Campanda, we offer a selection of 25,000 different RV rentals, so you can always find one that will work for your budgets and needs. 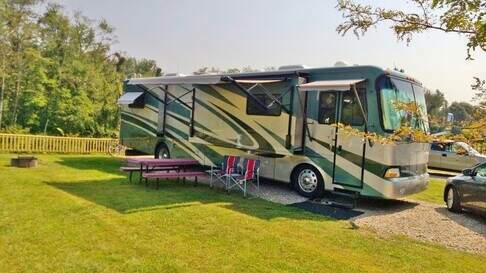 Regardless of whether you want a luxurious RV that can sleep a large group or a small van for a honeymoon in the San Jose area, we have the perfect model for you. Low prices. When you rent an RV, you don’t want to spend all of your time worrying about whether or not you can afford it. At Campanda, that will never be an issue. Our rentals come at the lowest prices in the San Jose area, guaranteed. If you do happen to find a lower price than ours, we’ll match it with no questions asked – even if you’ve already rented the RV. It’s all a part of our commitment to making your trip affordable and fun. Support. At Campanda, the thing that sets us apart from all other competition is our support. Our friendly support staff will help you coordinate an RV pick-up with your arrival at the airport to ensure you get off on your road trip on time. Additionally, they’re always around to help answer your questions and provide any additional information you may need. Don’t struggle through with a sub-par RV rental company – work with Campanda and get access to our award-winning support staff. 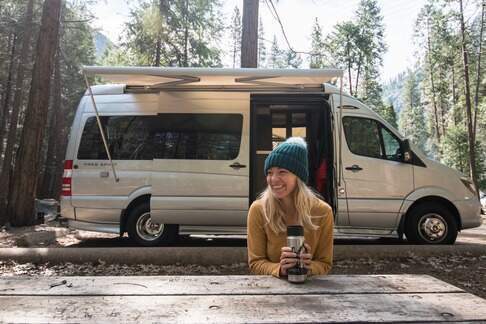 When it comes time to secure your RV rental in San Jose, California, it’s important to work with a reputable company that has your best interests in mind, and Campanda is your #1 choice for RV Rentals in San Jose! You can also check out our RVs in Los Angeles, San Francisco and the state of California.